Downtown Los Angeles is seeing a construction boom, though people have different opinions about when this boom exactly started. But according to the city’s Department of City Planning, by 2040 Downtown LA will see 125,000 new people, 70,000 new housing units, and 55,000 more jobs. Let’s review some of the trendiest things to do in this rapidly changing part of LA. Los Angeles is one of the most diverse cities in the U.S., which means there is an equally diverse option of eats. Go for authentic Japanese at Daikokuya Ramen in Little Tokyo, then hit up the neighborhood’s local bar scene at places like Wolf and Crane, Baldoria or Far Bar. Taco trucks are king in Los Angeles, and Guerilla Tacos and La Reyna Tacos #2 are satisfying local taco needs (be sure to check their location online before visiting!). Bestia in the Arts District, serving modern Italian out of a trendy industrial space, with a full ar and outdoor courtyard, has been named one of the best restaurants in the city. Finally, the historic Grand Central Market is a must-visit for foodies looking for cheap but tasty food-stall food, from currywurst to pupusas to pinoy barbecue. Don’t know what those are—go try them! 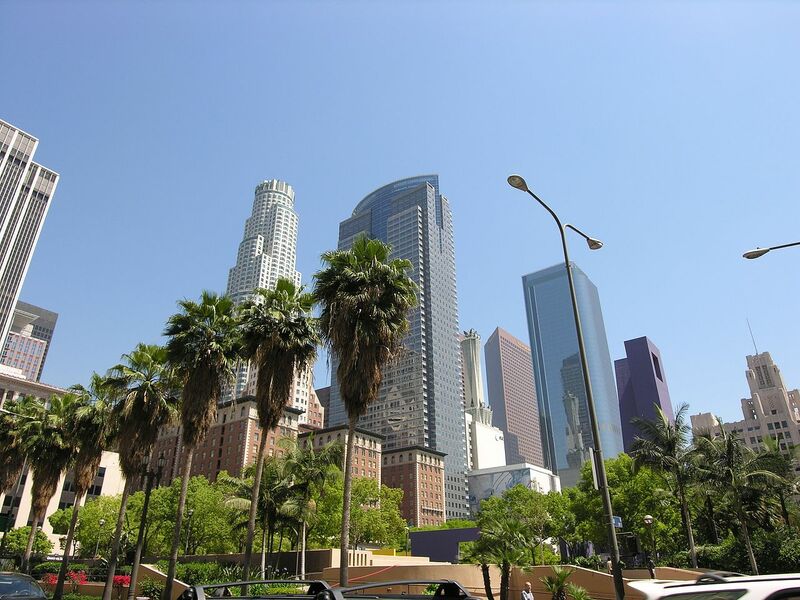 DTLA has no shortage of galleries and museums dedicated to art. There’s even an entire neighborhood called the Arts District, where you can find the hippest new bars, trendy cafes, grungy clubs and eclectic art spaces. Those interested in learning about the Downtown’s local art scene can join the monthly Downtown Art Walk, which happens on the second Thursday of each month, and takes participants around the vibrant Spring and Main Street areas where many of the city’s galleries are located. The art walk is described as part visitor center, part gallery, and part artisan market. Be sure to also check out The Broad, LA’s newest and most hyped contemporary art museum, where you can see a glimpse of philanthropists Eli and Edythe Broad’s impressive collection of over 2,000 post-war works, free of charge. Though hard to characterize, LA’s burgeoning bar culture finds its hub in DTLA. Enjoy the view from one of Downtown’s well known rooftop bars like Perch, one of the city’s first rooftop destinations, or The Rooftop, located above The Standard hotel. For beer, Angel City Brewery serves tasty local brews and doubles as an art space. Villains Tavern has become a local favorite for its live music, food, extravagant decor, and of course, craft beers and creative cocktails, while the Varnish serves delicious $13 cocktails from its small but charming speak-easy style spot behind a sandwich shop. Downtown LA isn’t far from Hollywood, and there are several movie palaces from the golden age of film still running in DTLA to prove it. These iconic venues are no longer used for just films, but double and triple today as spaces for concerts and even live radio shows. See your favorite band, or watch/listen to your favorite podcast in person at the iconic Theatre at the Ace, built to resemble a 16th century Spanish cathedral. The oldest and most grand movie palace in DTLA, the Los Angeles Theater, is French Baroque-inspired and opened its doors in 1931. The theater is always hosting screenings of classic Hollywood films across all decades. Be sure to get your tickets before hand—they sell out fast!